The training material in this book is arranged in modular format. The 12 modules are: 1. Teaching the REBT view of therapeutic change. 2. Goal setting. 3. Eliciting a commitment to change. 4. Disputing beliefs: an introduction. 5. Disputing irrational beliefs: the three major arguments. 6. Socratic disputing of irrational beliefs. 7. Didactic disputing of irrational beliefs. 8. Flexibility in disputing. 9. Examples of Albert Ellis?s disputing work. 10. Helping your client to understand the rationality of his rational beliefs. 11. Negotiating homework assignments. 12. Reviewing homework assignments. 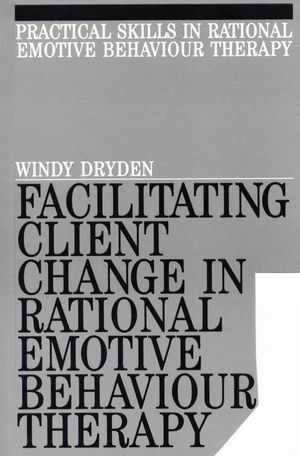 Windy Dryden, BSc, DipPsych, MSc, PhD, CPsychol, is Professor of Counselling at Goldsmiths College, University of London. He is the editor or author of over 125 books in the area of counselling and psychotherapy. His primary interests are rational emotive behaviour therapy and disseminating its theory and techniques to the general public, through writing short, accessible, self-help books. Teaching The Rebt View of Therapeutic Change. Goal Setting, Eliciting a Committment to Change, Disputing Beliefs - an Introduction. Disputing irrational Beliefs - The Three Major Arguments. Socratic Disputing of irrational Beliefs, Didactic Disputing of Irrational Beliefs. Examples of Albert Ellis's Disputing Work. Helping Your Client to understand The Rationality of his Rational Beliefs.